Sitting proudly on Perissa's unique beachfront in stunning Santorini, 9 Muses Santorini Resort is the epitome of style and luxury. Not only does this resort boast a magical location, but the wealth of on-site facilities, chic accommodation and tasty culinary experiences add to the luxury aura. The idyllic pool area is the perfect environment in which to relax and soak up the sunshine. Enjoy some downtime with a massage, or chill out in the outdoor Jacuzzi. Add activity to your day with a lively game of tennis, or work out in the gym. An exciting playground and children's pool adds to the excitement for younger guests. The guest rooms and suites showcase a neutral decor with wooden furniture and a host of welcome touches.Sit and watch the world go by with a drink on your furnished balcony or terrace. Culinary options embrace round-the-world tastes and flavours. Start the day with an American buffet-style breakfast, savour Greek style snacks for lunch, and tuck into traditional Mediterranean specialities for dinner. At night, kick back with a signature cocktail and ambient music in the stylish bar area. 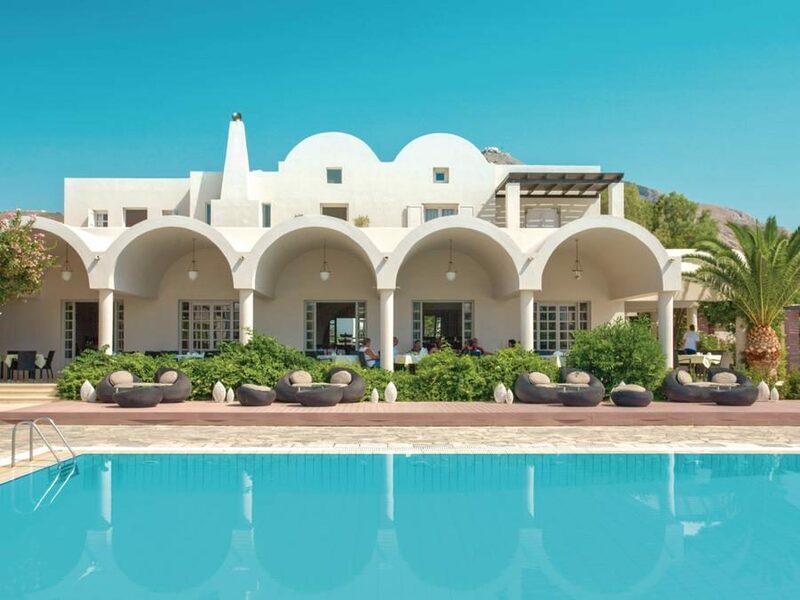 Discover why 9 Muses Santorini Resort is a popular place to stay for Santorini holidays. 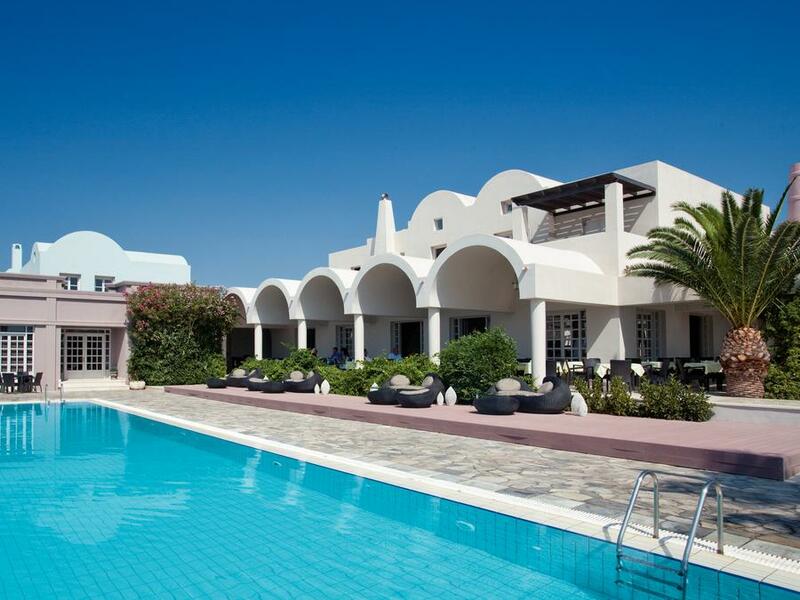 9 Muses Santorini Resort offers plentiful facilities. 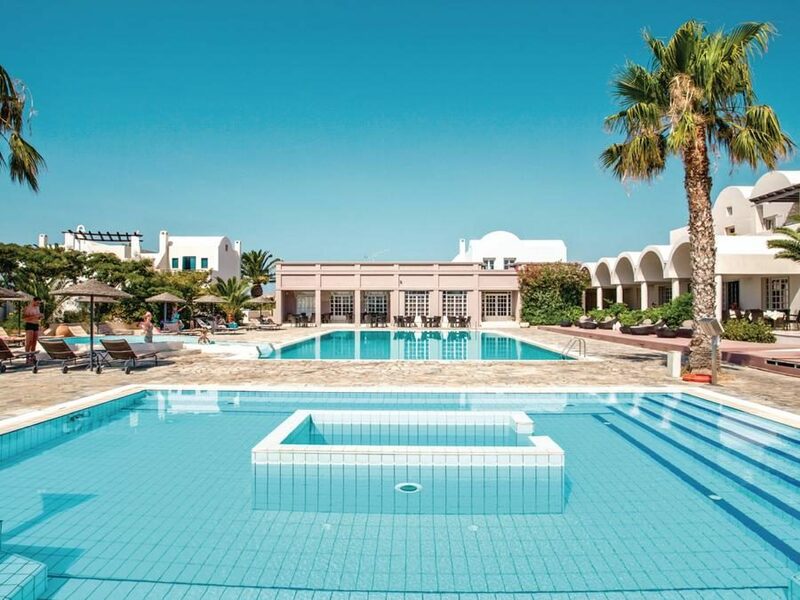 Highlights include: two outdoor swimming pools, sun terrace with sun loungers, children's pool, two restaurants, two bars, outdoor Jacuzzi, sauna, massage service, Wi-Fi access, and reception. Sports facilities include: table tennis, volleyball court, fitness centre, children's playground, tennis court, scuba diving, windsurfing, canoeing, and water skiing. The hotel has a total of 90 modern guest units featuring sea-view rooms and family suites. 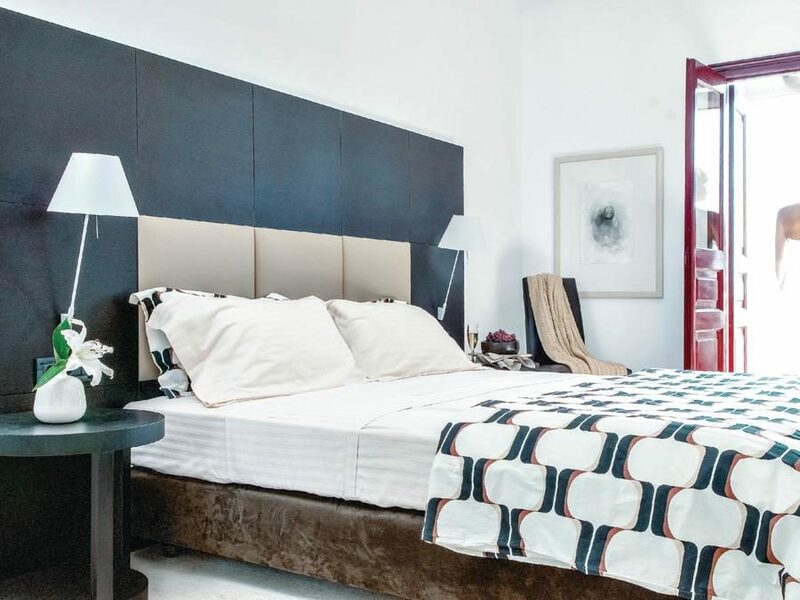 Standard rooms include: en-suite bathroom with bathtub and shower, furnished balcony, air-conditioning, alarm clock, wake-up call service, satellite TV, telephone, and fridge. 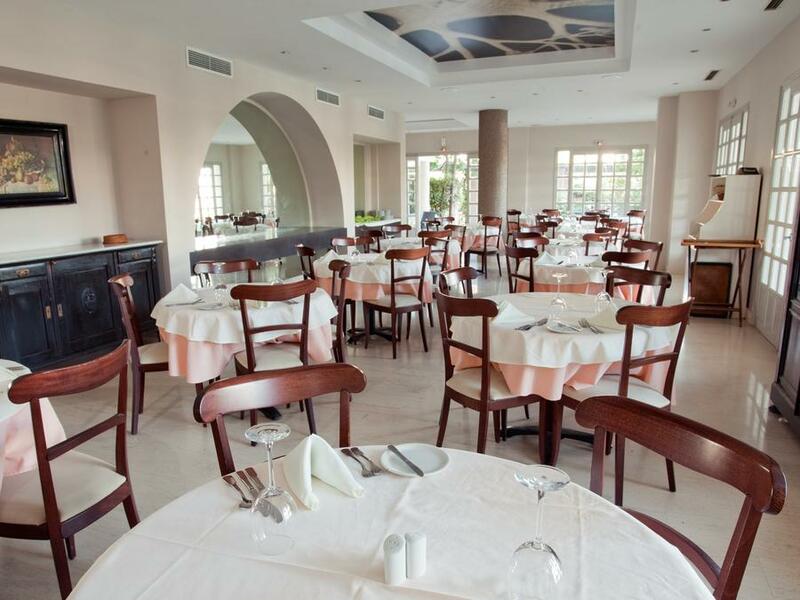 Therpsichore Restaurant serves an American buffet-style breakfast as well as an a la carte menu of Greek and Mediterranean dishes for lunch and dinner. Lunch baskets are also available on request. Greek-style light bites and snacks are served at the Thalia Pool Restaurant at lunch time, with traditional Greek specialities also on the menu for dinner. 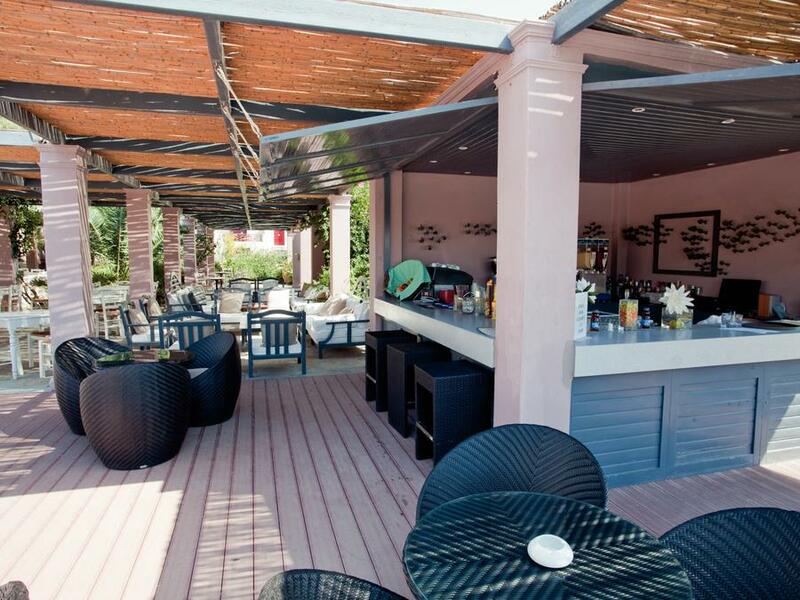 Thalia Pool Bar offers a wide menu of refreshing drinks and snacks throughout the day. A wide choice of drinks and cocktails are also available in the chic Erato Bar at night. of our customers rated this property good or excellent.